And just like that, the most anticipated time of the year, is right around the corner here in Southwest Florida. Tarpon season is less than 2 months out, which indicates now is the time to begin preparation for your next trip. For guides, this is the time when we get all of our 6000 and 8000 reels respooled and replace any tackle that is not ready for the abuse it will undergo throughout Spring fishing. For future clients, this is the time reach out to your fishing guides and hopefully get your desired dates locked in. Targeting these fish can be done a variety of ways. Live bait, cut bait, artificials, and chucking flies! 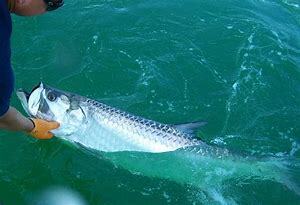 Tarpon Fishing can be stellar from the southernmost point of the Everglades, all the way up through Naples. 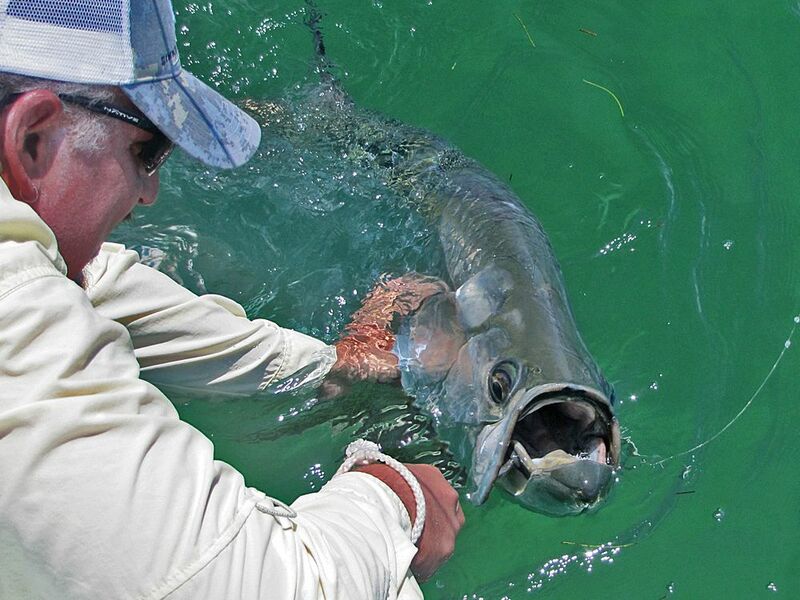 Each region offers a different style of chasing these Tarpon. Please feel free to contact me if you have questions about fishing the area, or would like to get your next charter in the books! Until Next time!...... Got to make that Cast! Clean Water in SWFL ! The waters South of Marco Island which are appropriately named the Ten Thousand Islands and The Everglades even further South have been been very fortunate this year. It is no secret that there has been a serious problem with the water quality on the West Coast of Florida, namely stemming from the Lake Okeechobee run-off that has increasingly harmed our waters year over year. Up until this point, we who call the Ten Thousand Islands home have been blessed as we have been unscathed by the blooming effects of the widespread red tide that has littered many News stations and social media timelines the past few months. Many who venture to fish this region of Florida do so in hopes of experiencing a fishery that has been left untouched by the human species in order to have greater chances of interacting with the targeted fish species. Make no mistake about it, the Everglades and Ten Thousands Islands continue to offer just that… As the Summer comes to a close, I encourage all anglers to make trip down to Southwest Florida and experience a truly one of a kind fishing experience. Gotta Make That Cast ! The dog days are Summer of are almost here. Without a glance at a weather forecast I can assure it will be hot and littered with thunderstorms in the afternoon. Good news is, the best place in the world to be during the Summer is on a boat running and gunning from one fishing hole to the next ! Summer fishing is all about working the tides and the correct water column depending on the time of day. The water gets warm so it is important to think like a fish and make the necessary adjustments to keep a bite going at all times of the day. It seems every year the biggest snook that are brought in on my boat are during this time of year. The big bruiser snook will be hanging in passes with strong current awaiting a nice sized sardine or mullet. With the prevalence of food choices for the predator fish in our area, live bait is very effective during this time of year as is cut bait when presented correctly. Without a doubt a doubt there will be some memorable fishing trips this Summer so take advantage of the beautiful fishery we have here in Southwest Florida and get out on the water! Do not hesitate to call with any questions on fishing the area or to reserve your next fishing trip! As always..
You Got to make that Cast ! The most anticipated time of the year, is right at our doorstep here in Southwest, Fl. What has been a very moderate winter for us, is quickly turning into Spring time like conditions a bit early this year. For Anglers, that means the arrival of the Tarpon Migration is taking place a few weeks earlier than it traditionaly would. Tarpon will be making their way north and stopping through in our passes, rivers and bays to feed and rest, before continuing their journey north. For us in Southwest Florida, it is the most exhillerating 2 months of fishing of the year. Targeting these fish can be done a variety of ways. Live bait, cut bait, artificials, and chucking flies! Tarpon Fishing can be stellar from the southernmost point of the Everglades, all the way up through Naples. Each region offers a different style of chasing these Tarpon. Now is a great time to give a local guide a call and reserve your trip. Please feel free to contact me if you have questions about fishing the area, or would like to get your next charter in the books! 2018 is off to a historic cold start for much of Florida. Fortunately, for us down here in Southwest, Fl, it has only bolstered our winter time fishery for redfish, trout and black drum. Many of the deep pockets and holes are loaded with schools of trout. Shallow grass flats and shoals are holding some of the larger trout in 2 ft or less. There is a variety of methods to attract these winter time favorites but hard plastic suspending twitch baits for the spinning guys and darker hued ep flies for the long rod enthusiast has proved consistent on my trips the last month. The good thing about water temps being very cold is the opportunities to chase laid up redfish and snook in very shallow mud flats. These fish will migrate to warmer flats as the sun gets comes up and is the perfect opportunity for those new to fly fishing or sightfishing to get the bug of casting at beautiful fish only a couple rods length away. Presentation is key in this style of fishing but the rewards of seeing an "eat" is what really drives anglers to love this method of stalking fish. I anticipate a few more good cold snaps that will keep these fish in the shallow clear water ove the next month and half. Now is the time to get a trip booked with your desired date. If you have any questions on fishing this area or fishing charters I offer please do not hesitate to reach out. Until next time.... Got to make that cast !! For many guides, fall fishing is one of the best times of year. Water temperatures begin to drop dramatically, consequently a variety of bait fish begins to show up and migrate to and from. All this activity signals to our predator fish friends that it is a heavy feeding time of year in preparation for winter. What that means for us Anglers is a consistent exciting bite that is sure to produce mixed bags of fish. The surprise of the month thus far has been the trout. In comparison to previous years, they have shown up early in very large numbers and ready to eat a variety of offerings. The Snook bite has slowed a bit in terms of numbers but the quality size snook are still a cast away as we have brought many upper to over slot fish boat side this month. Redfish will continue to be a first choice to target this time of year and I anticipate we are one more substantial cold front away from having them show up in the very skinny shallows to be sightfished with artificials and flies throughout a days trip. We welcome many of our northern visitors this time of year, and as always, if you have any questions on the area or would like to get out for a day of chasing fish, feel free to contact me. Until next time... Got to make that cast! 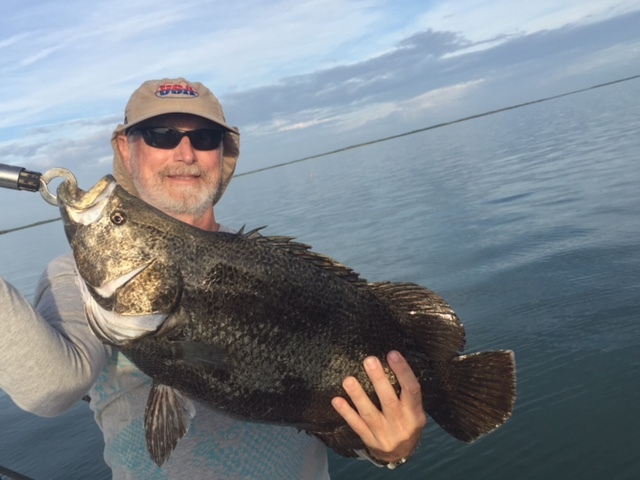 Here in Southwest Florida, the the welcoming of Fall typically coincides with some of the best fishing we have to offer. For us, these 'transitional months' are indicative of some very productive fishing trips to come. 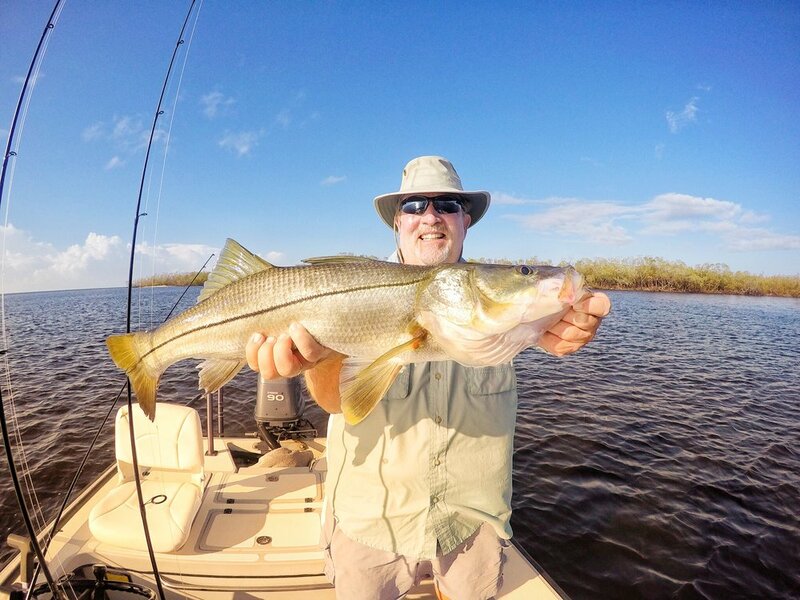 Snook tend to feed heavily this month as they make their way into the backcountry in waves. Redfish will largely be concentrated outfront as their spawn pattern approaches and our Tarpon will continue to hang around until the end of the year. Lastly, the crab traps are being put out by the thousands this week in preparation for the opening of Stone Crab Season which begins the middle of the month. This is a very anticipated time for anglers as we will be able to target triple tail along these crab pods! Now is the perfect time of year to plan a trip on the water in beautiful Southwest, Florida! Feel free to call or email me with any questions on trips or our fishery. The last several weeks the focus has been more on recovering from Hurricane Irma than it has been fishing here in Southwest, Florida. With the eye wall of Irma devestating much of the Everglades, Marco Island and Naples, there are some long days ahead of us here. The good news is that for many of us, getting on the water is a reminder of what makes this place so special and for those who have been fortunate enough to put the chainsaws down and pick up a fishing rod, it has been rewarding to say the least. I have made it out a handful of times in the last 10 days and I can honestly say it is been some of the best fishing we have had down here in years. Snook, redfish, and tarpon are out and quite frankly eating anything that gets placed in front of their face. The focus will be geared towards redfish over the next month as we are seeing schools of redfish forming in good numbers out front of the ten thousand islands. Big snook, and medium sized tarpon are mixed in the same areas as are fun sized jack crevalles. Be extra careful as you navigate the waterways as much of the landscape of these bodies of water have changed dramatically since Irma swept through. Additionally many of the channel markers are no longer there so exercise extreme caution even when running about familiar waterways. As always, feel free to contact me to set up a trip or for additional guidence fishing Southwest, Florida. Until next time.. Gotta make that cast ! We are nearing the end of the summer stretch and the fishing has continued to be great here in Southwest, Florida. Wise anglers are taking advantage of the first light bite and are off the water by lunch time. Then after a several hour break you have the option for a late afternoon trip where the bite will resume. Some of the best trips of the year have been right here in August. Snook, redfish and lots of young tarpon are roaming the backcountry and more importantly are eating. For those who enjoy throwing topwaters, this is the time to do it. Bait is all over the place and the warm temperatures have these fish super aggressive when the tide is right. All these considerations have made for some epic fishing trips as my anglers have seen the explosive strike of a tarpon and snook on their plug within feet of the bow of the boat. Fly fishing continues to be superb. In certain areas the water is gin clear even on the dead low tides, creating some of the best sight fishing we have to offerr year round. Gurglers and poppers are an effective fly to use at first light, then switch to your favorite white baitfish or black and purple ep fly as the sun climbs up. For those who are planning to visit this month, I encourage you to take advantage of some ideal opportunities to catch a variety of species. Feel free to call or email me if you have an questions or would like to book a trip! Summer patterns are continuing, as the afternoon rain accompanied by thunderstorms have been relentless the last month. Fortunately the first six hours of the day is all it takes this time of year to have a memorable fishing experience and catch a variety of species. Snook are still around in good numbers. They have retreated a bit from the shallow beaches and outside points as their spawn season is coming to a close they will slowly start making their way to the backcountry once again in time for fall. Fishing a bit deeper water can be the difference between phenominal fishing and not getting a hook up. Water temperatures this time of year are important as these snook will tend to stack in areas with extra rich current flow as this will move cooler water. Redfish are also around but require a bit more work as they are spread out over many of our waterways. Fortunately this month we have had some anglers pull several over slot redfish boatside and released to be fought another day. As with any month there are always surprises, both good and bad. July has been a pleasant suprise with great numbers of Tarpon sticking around both in the back bays and out front feeding heavily on certain stages of the tide. Early morning is the ticket to finding the fish that will readily eat a variety of both flies and artificials. Another great month of fishing in South West Florida is in the books, please don't hesitate to call on questions about fishing the area or info on fishing trips. Until next time... Got to Make that Cast ! Summer time is here and we have welcomed the rainy season with open arms as our long drought stretch is finally getting some relief. Hot summer days coupled with afternoon thunderstorms is the norm this time of year but on the fishing side of things the bite is just as hot. Bait is everywhere, tarpon can be found rolling and distant echos of snook popping can be heard in the serene, remote waters of our backcountry. Snook fishing is shaping up to be great this month just like it was last year. Lots of overslot fish are being caught out front on both stages of the tide. For the fly and sightfishing enthusiast there have been some amazing shots at big laid of snook in shallow waters the past several weeks. Tarpon season will be winding down the next month. These fish have been on the move quite a bit but once located the majority of these fish are willing to eat most importantly. Swimmer baits, plugs and flies have all been getting it done. This is an area where live bait is defintely not the only ticket to hooking up multiple times to the Silver King. As the days get hotter and consequently the water temperature continues to climb, keep in my the night fishing will be stellar. If you haven't experienced the sighfishing opportunities that exist at night for snook, tarpon and trout, the next several months will yield some incredible fishing trips. It is that coveted time of year that we have been waiting 10 months for. 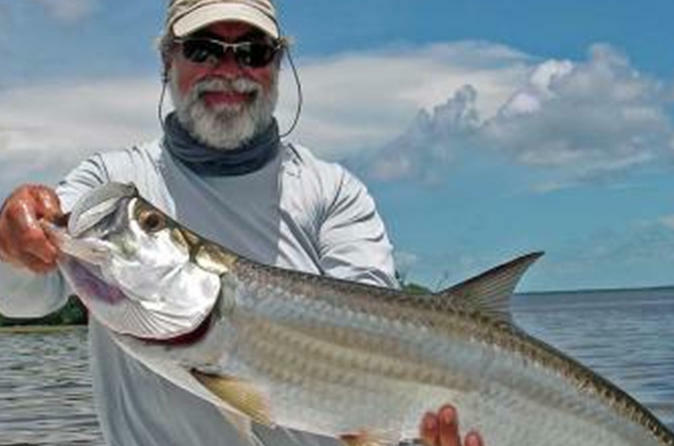 Many anglers, and guides alike are in full tarpon mode come May and June. Tarpon are making their way in full swing up the coast of Florida as water temps continue to climb. The reality is this year has been a bit wacky with consistent windy fronts that refuse to retreat. For the fly fisherman, it has not been easy. Beating the wind by getting out very early has saved some trips. There are good numbers of smaller fish (20-60lbs) showing upin the backcountry creeks when the wind is too tough out front. As water levels continue to rise expect this fishing to only get better. Nevertheless, the larger migrating tarpon are out and about. Locating them is always the key as these fish move around ALOT. I would guess we will have another 5-6 weeks of lights out Tarpon fishing. Now is the perfect time to call and get your trip penciled in. Snook and Redfish have been consistent targets all month but with the high winds we've had, it is very important to find clean water. Snook fishing will only heat up more. Lots of great sightfishing opportunities for these worthy adversaries along the white bottom areas south of Marco Island. With what we are anticipating is the last of the heavy windy fronts this weekend, now is the perfect time of year to get out there and experience beautiful Southwest, Florida! Until next time, Make that cast.. ! So far the month of April is off to a great start. The challenge for many trips the past month has been the relentless wind. Fortunately, I have had some great anglers on the bow of the boat capitalize on many quality fish that are still chewing despite the less than ideal conditions. Tarpon fishing kicked off with bang at the end of March but has taken a short term hiatus as we await the calm conditions in the gulf and the subsequent clean water. The rest of April appears promising as the Tarpon fishing will only heat up more and more from here on. Backwater fishing for snook and redfish is heating up as well. The majority of these fish have all moved out front making it much easier to target them along bays and shorelines that litter the Ten Thousand Islands. Many overslot 'snuke' as we like to call them, have been brought in and released to fight another day. Redfish although a bit more spotty, have been chewing along the broken, rocky shorelines in many of the dead end bays south of Marco. For the fly enthusiast, remarkable sight fishing opportunities in the backcountry for redfish still exist along with first class snookin showing forth along the beaches. Pompano and trout are also staged on the sandy shorelines happy to take a variety of feathers on the long rod. 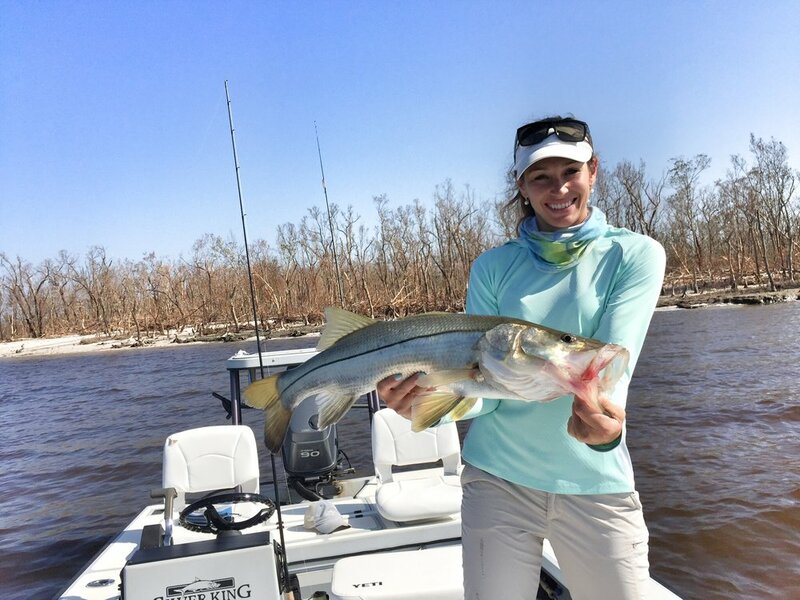 It's no secret that April and May provide some of the best inshore opportunities of the year for the Silver King and snook. Book a trip today to secure your desired date and make some memories that last a life time here in Southwest Florida! Until next time.. Make that cast. So far the 2017 season is off to a great start, with terrific fishing throughout the Ten Thousand Islands and Everglades on most days. The month of February looks to be just as promising with minimal, mild cold fronts and warmer than usual water temps. Water temps are peaking in the mid 70's, so our Spring-like trend are in effect. Water clarity has been good to great on calm days, making it ideal conditions for the sight fishing opportunist. The last several weeks have been stellar for those on the hunt for quality redfish on both fly and spinning gear. With our winter negative tides, coupled with easterly winds, we've been able to take advantage of the low water sight-casting opportunities in the back bays. Along the mud banks, oyster bars and creek spills, we've had days with numerous shots at quality fish. Lots of over-slot 'pumpkins' have been caught and released to be fought another day. Snook fishing has been per usual for this time of year but some of the trips this month have yielded great shots at sub-30 inch snook with some close to 40". The last half of the falling tide has been key and finding clean water is also crucial as these lunker linesiders can be quite finicky in the ultra shallow water. Trout fishing remains excellent. We'll often spend a little time jigging through some hard bottom holes looking for these tasty adversaries as we wait for the tide to line up. Pompano, sheepshead, jacks and large lady fish have all been fired up and waiting to take a properly placed offering of jighead with shrimp. We patiently await the arrival of our beloved tarpon. The typical migration suggest the middle of march but our warm water temps are pointing to them showing up a bit earlier. If you haven't had the chance to tame one of these prehistoric & magnificent creatures, the time to do it is on the horizon. Call today to book a trip as spots will be filling quickly. Until next month...Make that Cast!